Skilled project managers are the glue that keeps your team together. Without the shrewd judgment of an experienced project leader, your team is doomed to wander aimlessly from objective to objective with lowering morale, rising costs, and mounting hurdles. A great project development team can only be great with the right tools. Through the numerous project management methodologies and top-down inferences, there is one constant; management tools. Even the best managers can’t work efficiently without them. They range from the micro to the macro and cover all of the aspects of a project’s lifecycle. They create an atmosphere of greater cooperation and productivity. This makes them even more valuable to the heads. All leaders want effective teams and all effective teams use project management tools. In this article, we are going to cover some of the very best tools on the market today. 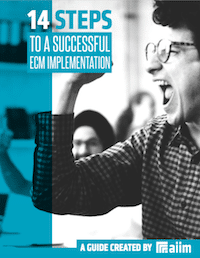 Checklist for ECM Project Success – 14 Steps I recently put together a short white paper distilling my years of ECM experience into 14 steps –here’s a snapshot: Keep your eye on the goal, and close tabs on the project. Create a framework for understanding how you will protect your information assets. Take time to get management buy-in on the front end. Explicitly think about how and when you will communicate about the project. Conduct an information survey to determine present-state. Create a business case with financial teeth. Build business and system requirements tied to the business case. Create a business classification scheme as a frame to your content. Clearly define user categories, roles, and contexts. Inventory the existing (and missing) people and technology assets to support the project. Create a meaningful pilot. Create a detailed roll-out plan – and follow it. Create a fall-back plan. After initial implementation, take time to determine and commit to next steps. The full white paper is HERE and FREE. Check it out.